So I've talked about paper and miscellaneous tools, it's finally time to talk about pens and ink! This photo is not mine, and was sourced from a Google image search. Medieval & Renaissance calligraphy was penned with a quill (a cured feather) or reed pen. Both were cut such that the writing tip had a width to it. Unlike (most) modern pens, the width of the line these pens left on the page varied based on a combination of the angle the pen was held at and the direction of the pen stroke. While fine point quill pens were used to add details and flourishes, almost all writing was done with a wide nib. Reed & quill pens were in common use up through the American Civil War despite the availability of metal nibs at that time. Quill pens are still available, but are relatively expensive unless you have a source of cheap feathers and are able to cure and cut them yourself. They also wear out as they are used, and have to be re-cut to maintain a sharp edge. I have yet to experiment with reed or quill pens because of the time & expense involved, instead opting to use modern calligraphy pens. 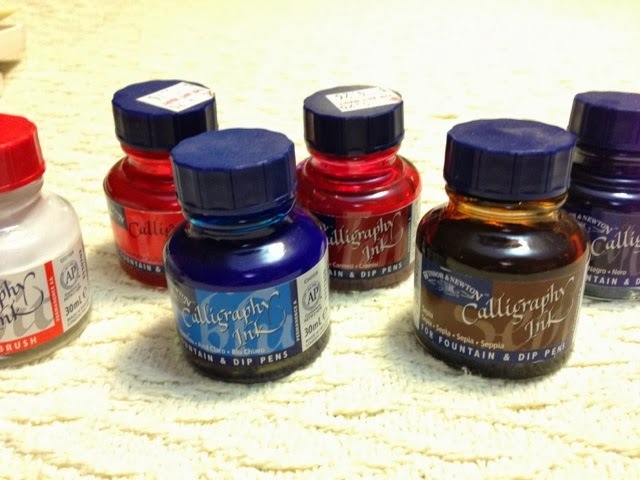 There are three primary types of modern calligraphy pens: felt tip, cartridge/fountain, and dip. Felt tip calligraphy pens have a chisel tip as opposed to a rounded tip. In a pinch, the chisel tip on some permanent & dry-erase markers can be used to practice or demonstrate calligraphy. Most felt tip calligraphy pens are not of a quality that I would recommend for anything other than practicing with. The inks are often not light fast, and like to bleed regardless of the paper they are used on. Their tips also do not leave as crisp a line as a cartridge or dip calligraphy pen. That said, they are great to practice with! You can keep one with you in your pocket to practice at any time, they don't have to be cleaned, never leak, splatter or pool ink. Just be aware that your calligraphy might look fuzzy. If you get frustrated, try practicing with a better pen on good paper. Cartridge pens (also called fountain pens) use an internal ink reservoir and can be capped when not in use to prevent from drying out. They have almost the same convenience as a felt tip pen. They typically have very stiff nibs, which can be useful for rigid hands like Gothic, but can make more flowing hands like Batarde a little more difficult. Left unused for a time, ink can dry out inside them, requiring that they be cleaned. Some cartridge pens can be taken apart for cleaning, others cannot. It's even possible to get a refillable ink reservoir for some brands allowing you to use your own inks instead of having to buy the manufacturer's ink cartridges. My only experience with cartridge pens has been with Rotring Art Pens. While expensive, they are very well built, control their ink flow wonderfully, and come apart for cleaning - the nib and plastic supporter pull out of the front (this feature isn't well advertised). They are available in 4 sizes: 1.1, 1.5, 1.9 and 2.3mm. You can also get pointed versions for drawing fine lines or touch ups. I would recommend investing in a 1.1, 1.5, and EF if you want to stick with a cartridge pen for your scribal work. I have no experience with other brands of cartridge pen. I have been told that some of the cheap cartridge pen sets you may find at your local craft store don't work well... Please comment if you have any particularly good or bad experience with other brands. I suspect the Manuscript and Brause pens available at John Neal Books are also excellent choices. The Manuscript is available in models for left-handed calligraphers, which is pretty unique. The Manuscript also come in different sizes than the other brands, including as small as 0.85mm, which could be quite useful for an SCA scribe. I started doing calligraphy with Rotring cartridge pens, and did my first several scrolls with them. I've since moved to almost exclusively using dip pens. There are a few advantages to dip pens: there are more pen widths available; you can buy several nibs for the price of one cartridge pen; it's trivial to rinse out a nib and switch ink colors; and they can be more flexible, getting closer to the feel of a quill pen. I also feel more like a medieval scribe using a dip pen in a wooden holder... Of course there are drawbacks as well: ink has to be carried in a jar, so you have to have a spot for the jar and to be careful not to knock it over while working; if you pause while writing, the ink tends to dry out in the nib; there's a risk of ink splattering if you drop the pen or tap it on the paper too hard; you need to dip the pen frequently in the ink and clean it out every so often, both of which can interrupt the flow of your work. Dip pens consist of a holder, a metal nib and sometimes a separate clip on reservoir. There are several brands of nibs available. The most commonly available are Speedball. My recommendation is to stay away... If you can get them to work, great, but my experience is they are of inconsistent quality and rust very quickly. There are many other choices available that are higher quality, but may not be available in your local craft store. My favorite nibs are the Hiro Rond. They are a medium stiffness, and when coupled with a Mitchell Reservoir they hold enough ink that I can complete 2-3 lines of text before having to dip into the ink again. 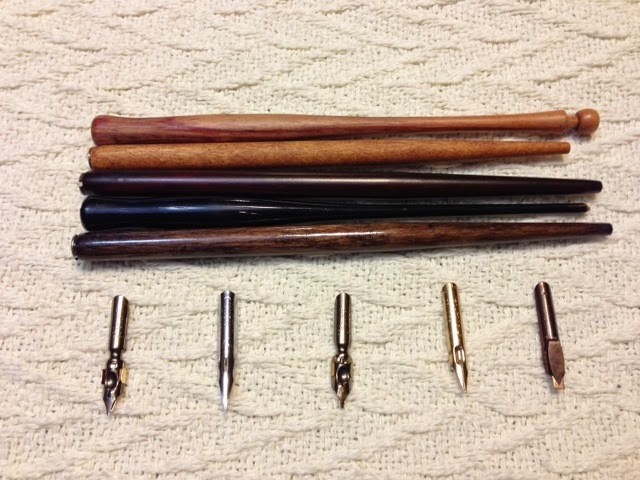 These nibs can sometimes be found in a starter set in craft stores under the brand name Manuscript Leonardt. This starter set includes a holder, 5 nibs and a metal nib case. Both the Hiro Rond and Mitchell Rexel come in numbered sizes, with 0 being the largest and 6 the smallest. Given how cheap these nibs are, there's no real reason not to buy all the sizes to have them available. Most of your work will probably be done with sizes 4-6. Brause nibs are very stiff, with a reservoir on top. They are great if you are heavy handed, and for more rigid hands like gothic. The are sized in mm of width, and range from 0.5mm at the smallest to 5.0 at the largest. To start, I would recommend 0.75, 1.0 and 1.5mm. I often use the Brause nibs when working on a piece in a gothic hand. They also make the smallest nib I own, a 0.5mm. Finally, there are the Hiro Tape nibs. They look like the Brause with the reservoir on top, but are a little more flexible. They are also a bit cheaper than the Brause. Because of the flexibility and materials dip nibs are made out if, they will eventually wear out. You can also damage them, dropping one could permanently bend tines out of place, inks can cause corrosion or rust, etc. Cartridge pens are typically made with gold plated or stainless steel nibs, are usually thicker than the dip nibs, and should last longer. Don't be afraid to retire a nib that no longer works right. When buying dip nibs, consider buying a handful of each of the sizes you are likely to use a lot. Having to stop in the middle of a project because you dropped your only Mitchell #5 down the drain while cleaning it will not make for a happy scribe. In addition to the flat nibs, you will probably want to have a couple pointed nibs for doing fine line work, flourishes, touch-ups, etc. Be aware that some small pointed nibs have a tubular base and require a smaller sized holder. 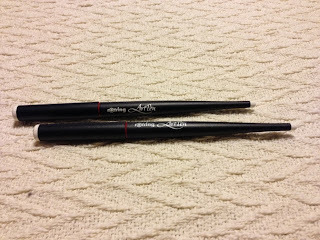 These are for extremely small detail work, and are very flexible. 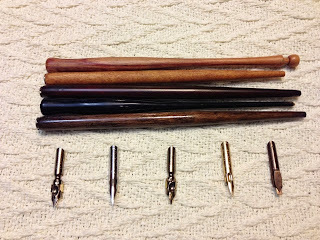 You may be able to find a starter set of pointed nibs at your local craft store such as this one from Manuscript Leonardt. If you have a cartridge pen, start with the manufacturer's ink. If you have a refillable cartridge for your pen, you should be able to use other types of calligraphy ink in them. Cartridge pens have smaller passages in them than dip nibs, so make sure the inks you choose are compatible with fountain pens. Do not use an India Ink in a cartridge pen. My favorite ink right now is a Walnut Crystal Ink that you mix up by adding warm water. It dries to a dark brown or sepia depending on how strongly mixed. The finished letters have some wonderfully subtle variations in color and very crisp edges. 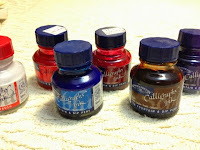 My favorite over-the-counter calligraphy inks are from Winsor & Newton. They come in a huge variety of colors & are pigmented and light fast. Any of the bottles with blue caps can be used in cartridge or fountain pens. 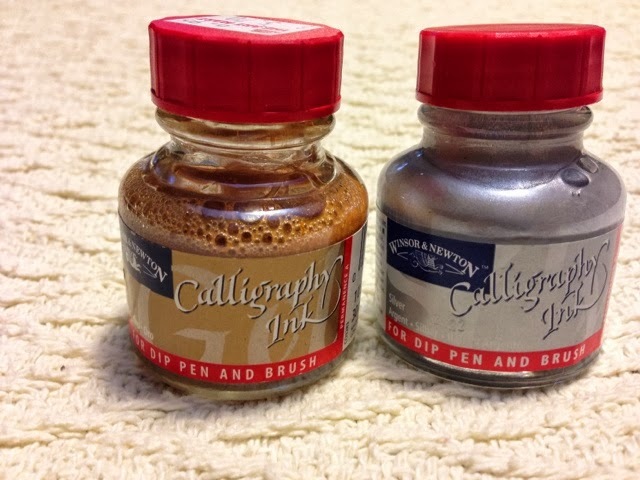 The red cap colors include Gold, Silver and White, which are only suitable for use in a dip pen or brush. 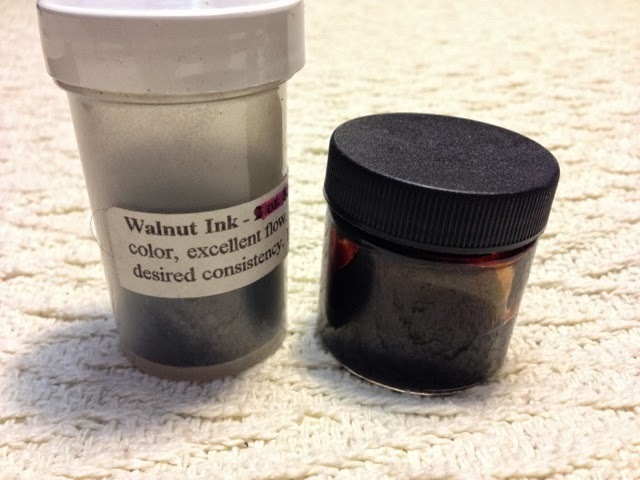 They are wonderful for use on dark papers. That's not to say that they are easy to use; they are thicker than the other inks, and can require a lot of practice, patience and mixing in extra water to thin them out while working. I haven't done a lot of experimentation with other brands of inks because the Winsor & Newton and walnut inks have worked so well for me. Be aware that there are differences in brands in terms of the thickness of the ink. Thinner inks may run too quickly out of the nib, running, bleeding or leaving pools. The gouache paints that are commonly used by illuminators on scrolls can also be used in dip pens, if watered down to the proper consistency. The Winsor & Newton gold ink perfectly matches their gold gouache when dry. I suspect that the red cap inks are the same pigments as in their gouaches, with more liquid added to thin them out. If you are a calligrapher, please leave me a comment reviewing the pens and inks you use. I've found that every artist has their own favorite tools and techniques. I'd love to learn about and share other choices.